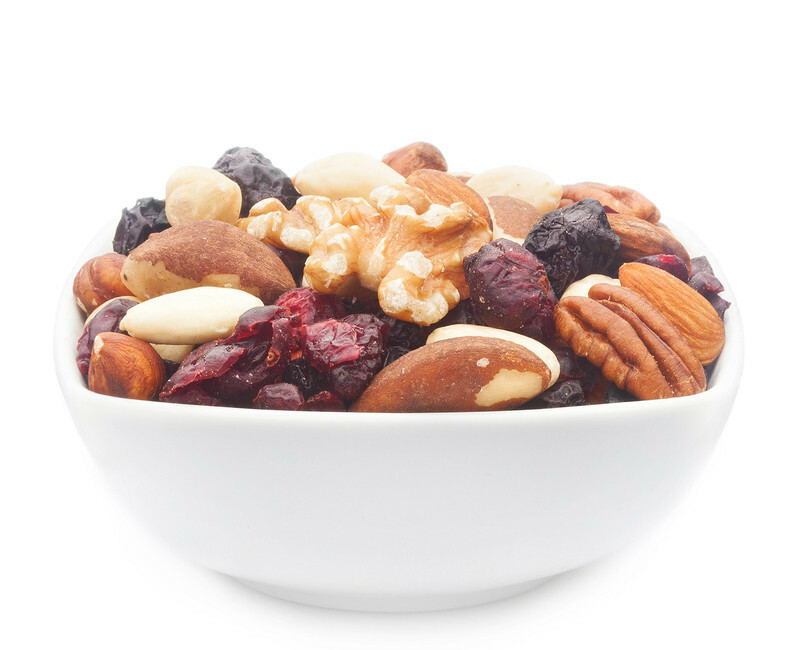 High-quality fruit and nut mixture with natural hazelnuts, almonds, peanuts, walnuts, pecans, cranberries and blueberries. HAZELNUT, ALMOND, brazil nut, walnut, pecan, papaya, sugar cane, sugar, cranberry, sunflower oil (non-hydrogenated), Cherry, preservative: E220 sulfur dioxide. May contain traces of GLUTEN, SESAME, SOY, MILK, SULPHITES and nuts. When the last rays of sunlight illuminate the glaciers of the mountain range, a symbol of grace and dominance, lends itself to the eye of the beholder. Even for experienced mountaineers, these visions are in dizzying heights or from the foot of the mountain from repeatedly a source of cheerful joy. So you do not run out of steam on the way to the summit,because we have a nut-fruit mix created for you. Hazelnuts, almonds, Brazil nuts, walnuts and pecan nuts are your companion, who mingled with breathtaking aromatic dried cranberries and blueberries in BLUE MOUNTAIN. In order for a high-altitude hike to turn out perfectly, a perfect preparation for the Tour is essential. The right footwear, highly functional clothing, adjusted to the specific needs of mountain tourists and snacks that provide stamina, a good sense of satiety, and for a fun snacking. With our BLUE MOUNTAIN you are set from the start to any feeling of hunger and an energy waste, you'll certainly oppose. Hazelnuts, almonds, Brazil nuts, walnuts and pecans with sweetness, dried cranberries and blueberries are reliable partners, to the culinary routes through rocky mountains that will not leave the base camp, but accompanies you to the very top to the summit. The culinary crampons on your mountain wall are now our best BLUE MOUNTAIN, a high-quality and carefully adjusted to the needs of alpine fans. Hazelnuts, almonds, Brazil nuts, walnuts and pecan nuts are there for you, for the high energy density, which provides you quick and easy with good carbohydrates and delicious cranberries and blueberries which makes the tour perfect as her soft, fruity flavour even when stumbling blocksthe mood uphold. An uncomplicated snack that fits in every backpack and every summit can be a walk through pastures meadows.